A 45-year-old man presented with 3 months of progressive right hand weakness. Examination showed mild atrophy and weakness of the right hand, and absent tendon reflexes. Cerebrospinal fluid contained 0.42 g/l protein (normal <0.45) and 1 lymphocyte/mm3. Electrodiagnostic studies revealed a multifocal motor neuropathy (MMN) with partial conduction blocks and severe denervation in the muscles of the right hand (figure 1). Sensory nerve conduction studies were normal. Charcot–Marie–Tooth disease, distal demyelinating polyneuropathy associated with monoclonal gammapathy, Lyme disease, lymphoma and malignant plasma cell dyscrasia were excluded using relevant biological, electrophysiological and genetic studies.1 The search for IgM anti-ganglioside GM1 (anti-GM1) antibodies using ELISA was positive. Coronal short tau inversion recovery MRI assessment of the brachial plexus demonstrated diffuse enlargement and abnormally high signals in the right brachial plexus (figure 1). The patient was diagnosed with definite MMN based on the European Federation of Neurological Societies/Peripheral Nerve Society guidelines and treated with intravenous immune globulin for 6 months.2 Right hand strength gradually improved. (A) Coronal short tau inversion recovery MRI demonstrates diffuse enlargement and abnormally high signals at the level of the trunks in the right brachial plexus (asterisk). Electrodiagnostic studies reveal partial conduction block in the right median and ulnar nerves, localised between the elbow and Erb's point (B, C; black arrows). No blocks are observed in the left median and ulnar nerves (D, E). In our patient, MRI abnormalities corresponded exactly with the symptoms and with partial conduction blocks.
. Multifocal motor neuropathy. Lancet Neurol 2005;4:309–19. Joint Task Force of the EFNS and the PNS. European federation of neurological societies/peripheral nerve society guideline on management of multifocal motor neuropathy. Report of a joint task force of the European federation of neurological societies and the peripheral nerve society—first revision. J Peripher Nerv Syst 2010;15:295–301.
. 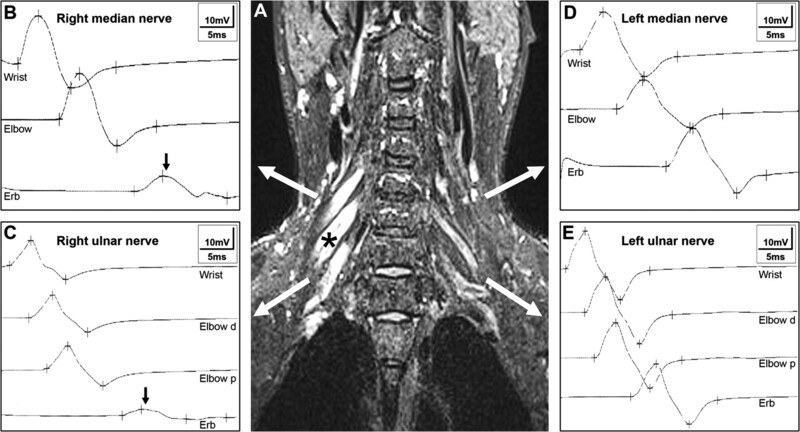 Magnetic resonance imaging of the brachial plexus in patients with multifocal motor neuropathy. Neurology 1997;48:1218–24.
. AAEM case report 30: multifocal motor neuropathy. Muscle Nerve 1996;19:269–76.
. Pathological findings at the site of conduction block in multifocal motor neuropathy. Ann Neurol 1993;33:152–8. Ethics approval This study was conducted with the approval of the Strasbourg University Hospital Ethics Committee.